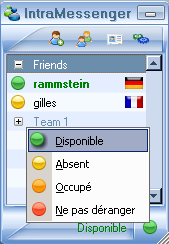 How can I translate the context menu (with command copy, cut and paste) in chat window from French into German? Or could you make a version with German translation? That's the full "EN.ini" file of current version, but where can I translate the context menu with Couper, Copier and coller etc. 0black0bird0 wrote: where can I translate the context menu with Couper, Copier and coller etc. so i have to replace it by a another menu. Thank you for translated the context menu. I had no problems until now.